Lake Bunyonyi is undoubtedly the loveliest magical lake in Uganda. Lake Bunyonyi Uganda is the deepest in the country and the second deepest in Africa after Lake Tanganyika in Tanzania. Because it is home to a big number of birds, it was christened “Bunyonyi” because the word literary means “many birds’. Travelers interested in birding safaris Uganda cannot miss adding Lake Bunyonyi in their itinerary in addition to other birding destinations in Uganda. This beautiful lake encircles over 29 islands. Each of these Islands holds a different historical story to be told. Lake Bunyonyi is surrounded by steep terraced hillsides that give it a gorgeous look. This magical place, especially with a morning, you will see mist rising off its placid waters. It has succeeded the Ssese Islands on Lake Victoria as the most frequently visited island by travelers on Uganda safaris, honey moon safaris in Uganda, Uganda birding safaris, family vacations, as well as a relaxing place for people from Uganda wildlife safaris and Uganda gorilla safaris. While there, you will enjoy the natural musical sounds from the birds around the lake. 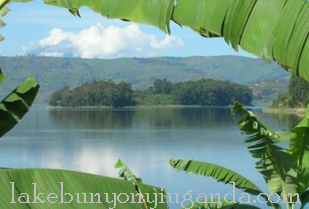 Best of all, unlike many lakes in Africa, Lake Bunyonyi is bilharzia, crocodile and hippo free. It also has crystal-clear waters that are all yours to swim in. Tourists that visit the Bushara Island enjoy its dense forestry as well as activities such as swimming and renting out canoes and sail boats. It’s also an excellent place to stay for those who enjoy bird watching as it’s a natural haven for birds not least because it’s so quiet and peaceful. ← Explore Lake Bunyonyi in a dug out canoe and see how fun it is!